We're meeting tomorrow (Aug 11th) same place as before (see below 20/July) at 1.30pm. Are these pictures of the 180bhp 206GTI? And here is the report from the Run we had in Adelaide today. If you're in Adelaide tomorrow and have a Pug GTI come along at 11am to Victoria Park Racecourse carpark opposite the Shell service station on Fullarton Rd!! A report from the guys in Canberra about the French Car Day. Stickers. We're going to have some 206GTi.NET stickers made up. Probably silver or white on clear about 18cm by 5cm. Cost around AUS$3 plus postage. If you're interested email me and I'll add you to the list. When I've got enough people I'll get them. Michael from Canberra sent me some pics and two quick mpegs of the install of a Griffiths' Engineering Quick Shift Kit. Have a look here. Shaun has sent some updated information about his Adventures in Peugeot Hifi. Have a look here. Continuing on the Hifi theme, James from HK has some pics of his attempts to soundproof the car. Look here. Nowhere Route has an excellent online route planner for Australia - even goes from state to state. Thanks to Guy. And the quite strange -> Truck Nuts. Paul has been busy and sent some photos from the Poissy Factory which produces 206's in France. Look here. Also, he sent a bigger image of the torque curves from the 206RC - here. Paul also said that "It will probably be called GTi 180 outside France". Also he translated a quote from Peugeot - "Peugeot announces a top speed of 220 km/h (on a circuit) (?!?) and a 0 to 100 km/h in 7 sec, against 210 km/h and 8.2 sec for the 206 S16 (2.0 GTi)". Also, if you were in Adelaide today travelling up Belair Rd in a black 206GTI and were followed by a silver 206GTI, then that was me! Email me. In Australia Peugeot have announced a recall of the 206s from Oct 2001 on to do with the key getting stuck in the starter motor on position. Goto http://www.recalls.gov.au and search (a direct link doesn't work!). Tim has fitted a Griffith's Engineering quick shift kit. His review is here. The guys from Canberra have asked me to setup a page for them. If you're in Canberra and want to go for some drives, have a look here. 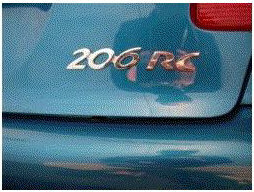 Paul has sent me a link to some more information confirming the 206SP or in fact the 206RC! Sportscartesting.com have some better versions of the pictures we've seen before. These seem to clearly indicate that the 206RC is on the way for next year. 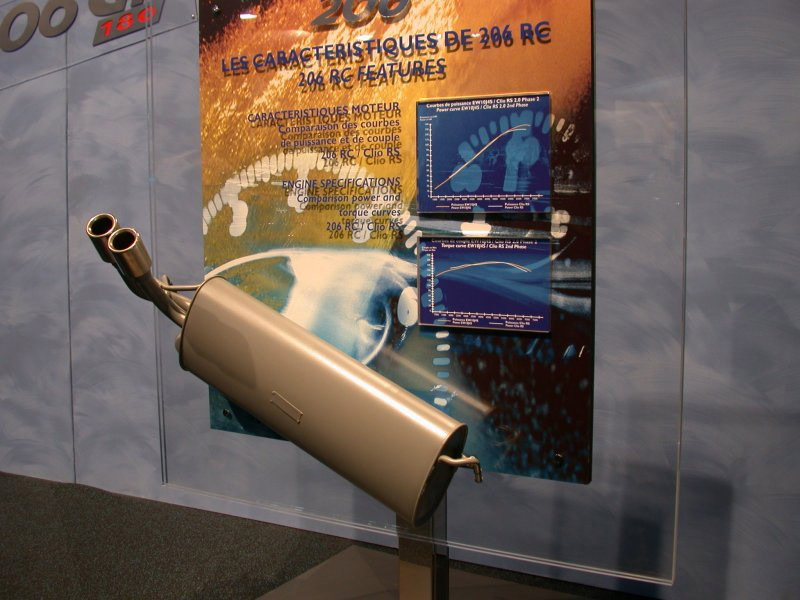 Have a look at the picture of the muffler on the wall and look behind at the torque curves etc. Jump here to look! Richard (a mailing list member) has put new grille from Autoparis on his car. He has some photos. Damian has replaced his crashed 206GTI with a (gasp!) 307 HDI! Some pics and a bit of a review here. AutoExpress has some information about the Peugeot 207, the replacement to the 206. Based on the same platform as the Citroen C3 it'll be bigger and more luxurious than the 206, but Peugeot are keen to make it a good drivers car. More information here. Well, went to Melbourne and went for a drive with some people with 206GTIs there. Pics and some video here. Well, Peugeot came 1,2,4 in the Rally of Catalunya in Spain! Well done to Gilles Panizzi. Melbourne Run on Sunday 31/3/2002 - 10am for more information, join the mailing list here and post saying you want to come, someone will email you the location and contact details! The 180 BHP Super 206 will be available in the end of 2002, only as 3-door model as a limited edition, 3000 only. Price in Germany EUR23000. Seems to be a FIA homolation-special (like the GT, big bumpers, so: exactly 4 meters) for the 2003 WRC rally-version. Arwi from the Netherlands has heard something similar - except for the date -which he reckons will be September manufacturing start for early 2003 delivery. The big thing will be whether it's 6sp or 5sp. Arwi thinks it'll have a LSD, but no 4wd. This is consistent with what I've heard elsewhere. Arwi has an interesting picture - a 206RC badged car at what looks like a trade show. Have a look here for the badging. Is this Peugeot trying out a new name for higher performance cars? It's interesting that the RC Spades and Diamonds also had this name! Arwi's information seems to have come from http://peugeotgti.com. Well, I guess we'll have to wait and see. I suspect most of the information, aside from the 180bhp and that the car exists is conjecture at this point in time! Paul from Denmark has sent an amazing article on how to build your own quickshift for the 206 (GTI and otherwise) using a modified Peugeot part! Have a look here. Richard has added a review of his 2002 Spec 206GTI. Some 206GTI owners in Canberra, Australia had a drive on Sunday. Have a look at some pics and a video here. To anyone else out there - if you go on a drive with some other 206 owners, let me know and I'm happy to put pictures and small video clips up. Organize one in your area today. If you don't know anyone, join the mailing list and post! Peugeot have done well in the Corsica Rally - Panizzi First, Gronholm Second, Burns third! More here at Rally Live.com. Well, according to AutoExpress (and others) the 206SW will be going into production. Bit higher and a bit longer than the 206 is normally, it probably won't come with the 133kw engine destined for the 206 Sport. More here. Leslie from Malaysia sent me some interesting information about a Swiss company making a turbo upgrade for the 206. Have a look here for more information. March already. Shaun has sent me an update to his article on his Hifi adventures with his 206. This one has pictures! The updated version is here. Paul has sent me some pictures of the 206SW which hopefully will become a reality sometime! I've also (finally) added 6 pictures that I've scanned in of the Mallala Track day - have a look here. Also, I've trimmed the comments on the home page to improve the loading time a bit! Peugeot have released a few more "concept" cars which look pretty cool. Both based on the 307 floor plan the RC Spades and RC Diamonds, these are some quick coupes. Have a look on AutoExpress also on AutoWeb with more pictures. Also, Alex from Greece has sent me a link to his webpage detailing his 206 Air Intake mods. Whilst it's not strictly for a GTI, it should give people a few ideas. Some of the members of the mailing list in Victoria had a run on Sunday which included 7 GTIs - some photos and a quick write up here. Sorry the site was down for a few hours today - apache didn't start - not quite sure why! Also, if you look at this site regularly you may have noticed I've rejigged the links on the right hand side - just reordered them a bit. On an obscure part of Sony's website SonyStyle I found a Sony headunit which plays MP3s and VCD/SVCDs called the CDXV7800X. No other reference to it by Sony. Looks similar to the Sony headunit available in the USA the CDX-MP450X which may mean it's not very good. AutoExpress is reporting that a 206 Estate is undergoing testing in Sweden. Apparently it will come out later this year AND have the 2.0L engine as an option! More here. Also, Tim (owner of the burning Pug) has his new 206 a 2002 spec and has kindly come up with a summary of the new features here. Peugeot have announced the 307 SW People mover! and here. Peugeot have done well in the Rally of Sweden going 1-2-4. More here. Went for a drive with some people from Adelaide (no other 206GTis though - where is everyone in Adelaide?). Some pics and short video clips are here. Almost the end of January. Rally of Sweden starts tomorrow, hopefull Gronholm will do well in the ice and snow. I was passed by a Silver GTI with a GT body kit and WRC like wing on the old Freeway near home (near Eagle on the Hill in Adelaide). Unfortunately wasn't in the Pug. Anyone out there? I still keep trying to find a decent headunit for the car which will support MP3 and work with the AudioStalk through either an Audioleads or ICD adapter. Sony have just released the MEX-HD1 which not only plays MP3s but has a Hard Disk in it and will RIP MP3s itself. More info here. Looks pretty expensive though. Here's Peugeot's take on the 2002 WRC Monte Carlo Rally. Sniffing around the net today, and I found this page which has some mpeg movies of Marcus Gronholm zipping around the forest in the 206WRC. Also, the Peugeot Lion Fan Site has Peugeot oriented World Rally coverage. Yay! Alex, the answer is http://groups.yahoo.com/group/peugeot-206gti (this is the URL to the archive for the Peugeot 206 GTI mailing list). Found this on the Pug Sport website - Peugeot Upper Mesh Grilles made from the same material as the lower mesh grill. Not a good pic so hard to tell what it'll look like. On surfing around the Peugeot website I found an Official 206WRC club - Le Club 206 WRC - in French only of course! There's some interesting things there, like a nice 2002 Calendar. Two from Andrew MacPherson - some info and pictures on his speaker parcel shelf and his home made heat shield for a filter. Some pictures of the 206 Escapade Concept car. I'm slack again. Almost the end of the year. Almost Christmas. Almost my birthday again. A few things I should get around to putting on the site - soon I promise! Someone emailed me a link to a comparison of the Clio, Satria and the 206. Also, the Peugeot 206 Sport with a 134kw engine will be available in late 2002. Estimated price $39,990 in Australia. Apparently some dealers are taking orders now! We don't know if it'll replace the GTI or be sold along side. Peugeot have had a good week. The Peugeot 307 is the European Car of the Year 2002 and Peugeot are 2001 FIA World Rally Constructor Champions. Sorry about the lack of homepage - I've been messing around with Apache. My fault. On a non-Peugeot note, I've subscribed to Randy Cassingham's This Is True mailing list for about 7 years. It's one of the funniest mailing lists you could hope to be on. Back to the Pug, the new A539s are awesome. Much better grip than the Pirelli's. You can drop the clutch at 3500rpm and not spin the wheels rather than just over 2000rpm. Gronholm goes crusing Paris in the 206WRC - look here. Why can't I do that?? 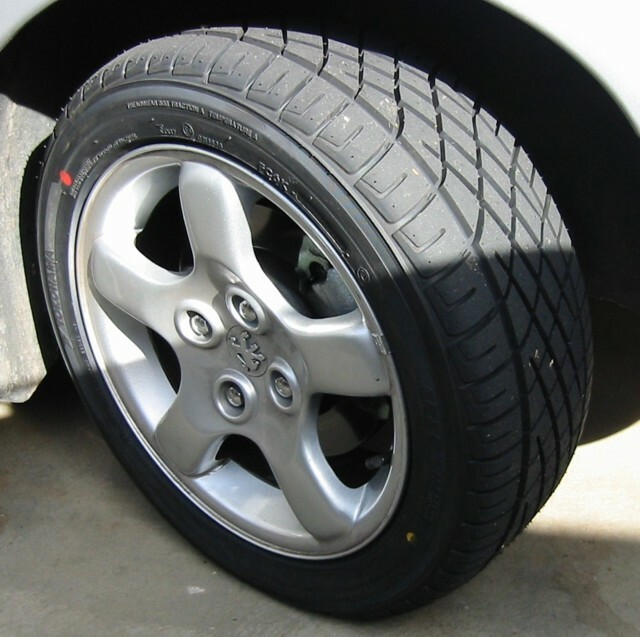 I've got Yokohama A539's now - 195/50R15s rather than 185/55R15s as they're $AUS$25 less a tire! Slightly (2mm) smaller radius, but that doesn't make a big difference! Picture here. Better than the P6000's - more grip, but more steering effort required (sightly wider). More later when I've worn them in a bit! The Peugeot one seems to be a ISO9141-2 - which is a bit different to most of the USA stuff. (OBDII is a usa based thing, so if you do a google search, that's what you'll find). There's also a new Induction Kit from Pipercross called the Viper. Also, Hayes look as though they've now got a Maintenance manual for the Peugeot 206 but not the GTI! Damian Robins bought a stalk adapter for Sony headunits from In Car Developments and has found it works REALLY well with the stalk in Oz spec cars. Cost from ICD is around UKP42.55 plus shipping. Damian says to email andy@icdltd.net. Gee. November already! A few things. Marcus Gronholm for Peugeot won Rally Australia and now lead Ford in the Manufacturers Championship. Next round is Rally Great Britain where Ford have to beat Peugeot by 4 points to win. A number of people (including Ben Lyall) have been trying EBC GreenStuff pads to great effect. Cost seems to be simila to the OE pads. Jason Ng asked me to warn people about people stealing badges off of cars - seems he's had the badges stolen from his 206GTi today! Bummer. Telstra Rally Australia starts this weekend. Australian Free and PayTV Coverage details are available. Peugeot did well in the Tour de Corse (Rally of Corsica in France). Have a look here. Rally of Corsica is on this weekend. See how the Peugeots are doing. Damian has sent me some pictures to add to his stereo page. PugSport GTI (a UK company) have some cool stuff for the 206GTI including Devil Headers and Lexus Style Rear Lights (not normally my thing but I reckon they will suit the 206GTI as they'll match the front lights). (I have no link to this company, but am happy to "review" any products sent to me :-) Also, Auto Paris will be importing the "Lexus" lights into Oz. Ugh! I keep forgetting to put this link up. Tim from the 206GTI mailing list had his car go up in flames! Have a look here. I'm still pondering replacing the factory Eurovox head unit. I've started to get into MP3s for convenience (not sound quality!) and am considering an MP3 playing headunit. Problem is they're all quite expensive and all have drawbacks. Highway MP3 has a good list of various ones and their pros/cons. I'd like a Sony one so I can get it to work with the Audio Stalk with an adapter, but the current one isn't available in Oz. I went to a track day yesterday. Pics and MPEGs. Damian (on the Yahoo! Groups list) found the Purflux website which contains information on the filters used in the GTI. Have a look here for the 206 GTI filters. Damian's also been at work on his stereo. Contains some information about the Eurovox CD player fitted in Oz and some of the issues with the Oz Audio Stalk being different! This report on the Peugeot 307SW and 206SW concept cars at the Frankfurt Motor show are interesting because the engine in the 206SW (133kw/2.0L) is said to be destined for the 206GTi as early as next year! On a sad note I'd like to send heartfelt condolences to everyone affected by the tragedy in the USA today. I was in NYC earlier this year and looked out from the World Trade Centre, and it saddens me that I will no long be able to. It is a despicable act. The car has been feeling a bit darty off centre, so I took it in for a wheel alignment - the car feels a bit better - the adjustment was the toe settings, and that made a bit of a difference - they couldn't find a slow leak in one of the front tyres. Kristen Wheatcroft has put together a site which contains a list of companies that produce parts for the 206GTi - have a look here and click on the car link menu on the left - it's quite good and detailed. Also, Kristen included an email from Kenwood - apparently Kenwood make an adaptor (part CKR70EU) with a module for the stalk (CAW72P - 4 function or CAW73P for 6 function) for adapting the audio stalk for use with Kenwood Headunits. These are available in the UK. In Car Developments have an adapter for Sony and Panasonic headunits (Sony is SON13PT). An alternative for the Audiolead one, but slightly more expensive. I recently came across a company that was developing adapters for the display as well. Connects 2 are doing all sorts of adapters - have a look on their website under products and under quick reference. 2 days ago to do an install and I was okay). quick and fun, buy the the Pug. Kurt Chu has done a Brake Upgrade, have a look.